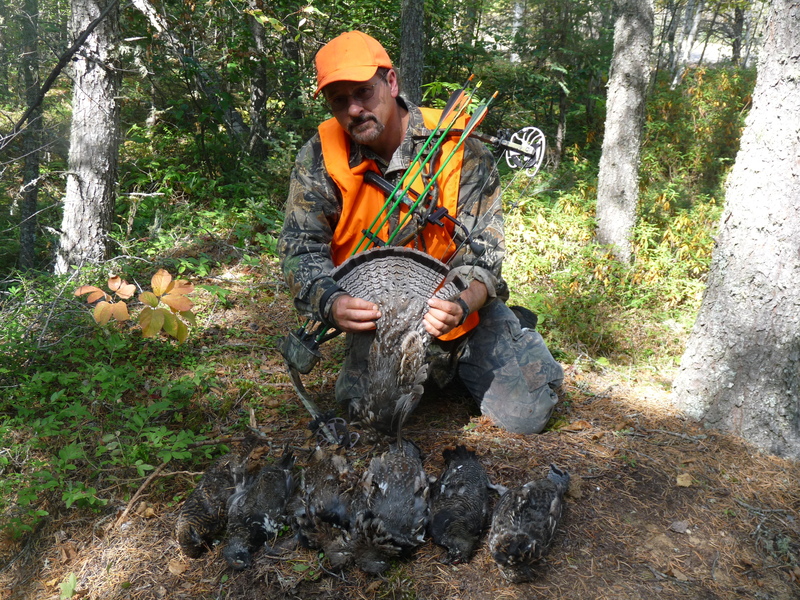 Grouse hunting is a relaxing pastime that is getting more and more popular every year. In our area bird hunting can be an adventure in itself! Driving down the back roads & trails in your truck or on your ATV can not only be thrilling but breathtaking as well as you wander down roads that are in full color deserving of natures fall foliage. Just taking in these magnificent fall colors, peaceful wilderness & the wildlife that you’ll encounter will make you feel like you are definitely “North of the Tension Zone”. The bush trails with the rise of the birds, singing of the guns, the smell of the pines along with friendly comraderie back at the camp will not long be forgotten. Surrounding Wawang Lake are hundreds of miles of ATV trails, old logging road, game animal trails and hiking trails. The bush is just stuffed with these upland game birds and on a sunny fall afternoon you will see hoards of them. Many of our guests choose a fishing / grouse hunting combination package and spend half the their time taking advantage of the awesome northern pike and walleye fishing and spend the rest of their time enjoying the clean fall area and exploring the many trails where birds are plentiful. There are three species of grouse found in Ontario. Ruffed Grouse is the most common and comprises of 80% of what you will encounter during your hunt. The limit for grouse in Ontario is 5 birds per day in any combination of species with a total of 15 in your possession and you will be surprised at the number of grouse we do have and how fast you’ll bag those limits. Compared to other areas the grouse cycle in our area has remained consistently high over the years and we credit this because of less human population that other places are known for. In a nutshell what you’ll experience at Wawang Lake is a vast area of complete privacy during your hunt. The most popular guns for grouse hunting are .410 or 20 gauge shot gun and some hunters use a 12 as well. Quickly becoming more popular is BOW HUNTING for birds. To increase the thrill and excitement of your hunt give your bow a try and the challenge alone is sure to thrill you. You should be aware of special customs and immigration issues whenever traveling to another country. For people with prior legal issues (including DWI’s) you need to find out what restrictions may be placed on your travel. Visit the Border Crossing Link and/or the Canada Citizenship & Immigration. A $150.00 non-refundable deposit is required at the time of reservation to guarantee a hunt. Balance to be paid in full upon arrival at the resort. Hunting deposits and installments are non-refundable. Consideration may be given to date transfers if vacancy can be filled.